Founded in late 2012 by Stephen Tibbitts, FabLab Tacoma is a community-based prototyping and technology workshop that’s open to the public with a membership business model. I spoke with Stephen recently to learn more. “We opened up the FabLab to provide easy access to cutting-edge design and prototyping equipment, and to bring educational opportunities and a supportive community for students, inventors, artists, and DIY enthusiasts,” said Stephen. The location was strategically chosen to be right by the University of Washington’s Tacoma campus so that the educational community can take advantage of the FabLab’s digital fabrication equipment, classes, and prototyping services. 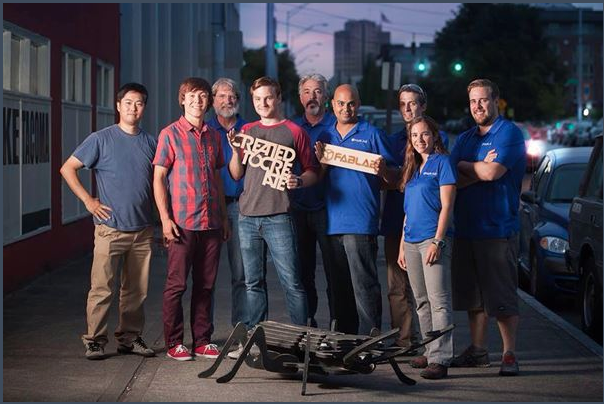 FabLab Tacoma is a member of the customer/fabber/designer community hub, 100kGarages.com. You can read the full story about FabLab Tacoma at the 100kGarages.com blog.